VISIONS OF THE NORTH: Sir John Franklin a Freemason? Sir John Franklin a Freemason? In researching the history of Sir John Franklin's last expedition and its aftermath, there have from time to time been a number of surprises. In quite a few of these cases, it's been because a fresh look at what we already "know" about Franklin has shown that we were, in fact, wrong: wrong about which railway engines were likely installed in his ships, wrong about which archive held which of the Daguerreotypes made of him and his officers; wrong about the extent and significance of lead poisoning among Franklin's men. To this list may now be added another discovery: the statement that Franklin was a Freemason -- often repeated in the literature of the 1850's, particularly in the United States -- can now be shown to be wrong, and on the best possible authority: Lady Jane Franklin herself. 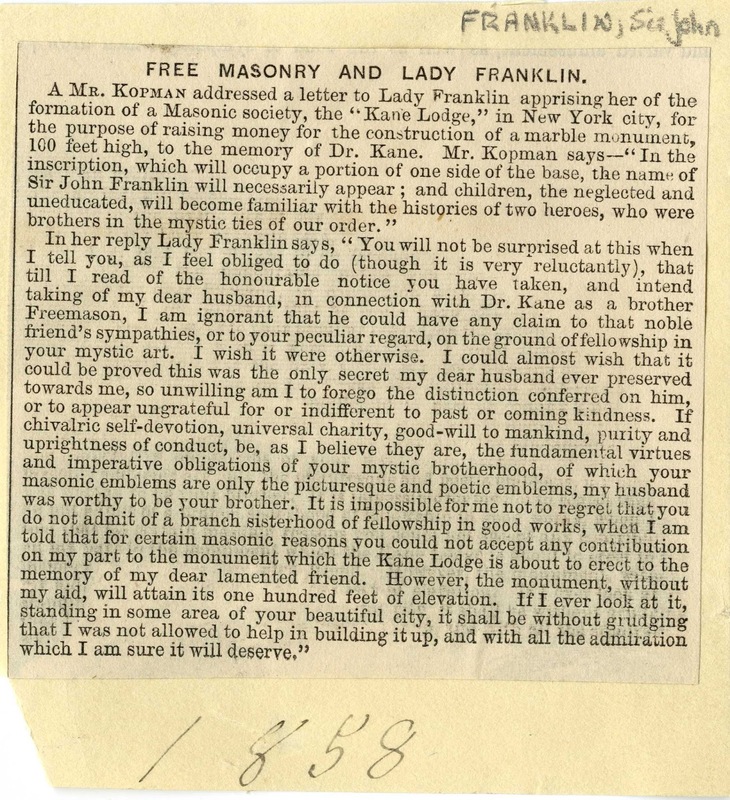 Till I read of your honourable notice you have taken, and intend taking, of my dear husband, in connection with Dr. Kane as a brother Freemason, I am ignorant that he could have any claim to that noble friend's sympathies, or to your particular regard, on the ground of fellowship in your mystic art. I could almost wish that it could be proved this was the only secret my dear husband ever preserved towards me, so unwilling am I to forego the distinction conferred on him, or to appear ungrateful for, or indifferent to, past or coming kindness. The news may have arrived too late to correct this assumption in tributes already printed, or perhaps it was simply overlooked by the public press, which continued to refer to Franklin as a Mason in the years following. 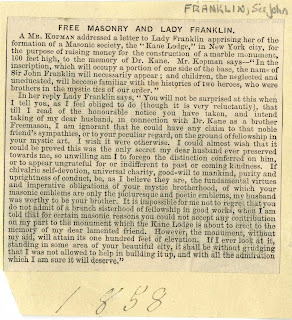 Certainly, it does not in any way diminish -- nor would Lady Franklin wish it to -- the sincere spirit of Kane, whom she considered a dear friend, or his brother Masons, in wishing to draw attention to the bond that, in so many other ways, connected these two men. And indeed there is a connection; while we can't attribute it to Franklin, a purple glass Masonic seal was among the relics recovered by McClintock from the boat in Erebus Bay, and is preserved to this day at the National Maritime Museum. From it, we may be fairly certain that one of Franklin's officers or men was in fact a Mason, and that in his quest to find them and bring them succor, Kane was acting with a particular benevolence toward at least one of his Brothers. I am grateful to Mr Peter Aitkenhead, Assistant Librarian at the Library and Museum of Freemasonry, for his assistance and generosity in forwarding this clipping. I posted a photo of the emblem on the purple ring to the Freemason's Facebook page last year, asking if anyone could identify the lodge. If anyone could, they declined to. Someone in the brotherhood might have more luck. Very interesting. I wonder who the Masonic Expedition member was - or members? I carried out some researches along these lines and was able to obtain confirmation that James Fitzjames was not a Freemason either. Any chance it would have been the Scottish medical men? Just a thought for likely lodge members. Thanks, Randall, William, and Eric for your thoughts. I will be showing an image of the purple crystal seal with my talk at the Kane Lodge (it's actually not a ring, but a crystal seal for making an impression in wax) to see if they can offer further insight. We can eliminate Fitzjames, and I haven't found any indication that any of the expedition's medical men had Masonic affiliations ... but I will keep looking!